The The powerful Terrah are builders, craftsmen and fighters all at the same time. They consist of many strong characters and use the strengths of the earth. They can initiate massive earthquakes and conjure up powerful storms. 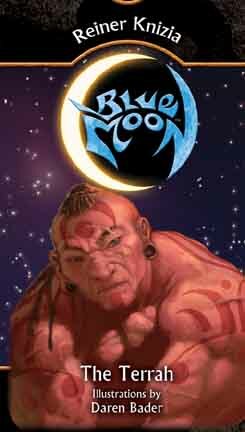 The original Blue Moon game comes with only two preconstructed races for you to use; this expansion adds one race to your collection to utilize during a game. The Terrah is a powerful race, although they aren't very tricky at all. It's a favorite of my wife's, and that's the whole point: you want to have enough races where everybody will have their favorite and identify with a specific one.